Filtrex Inc. is the leading manufacturer of regenerative pre-coat media filters. We have over 31 years of experience in the filtration business. Filtrex Regenerative Perlite Filters have developed a reputation for dependable services in tough applications. Of particular importance to facility designers and managers are the significant savings afforded by Filtrex based systems. In many cases filter plant operational costs can be reduced by up to 90% as compared to conventional sand , while providing unequalled water clarity. Our all stainless steel construction, yields a high quality product which given reasonable care and maintenance, will give a service life equal to that of the facility in which it is installed. In fact, over 97% of all Filtrex filters ever manufactured are still in service. Reducing Operating Cost, Conserving Resources. Conventional sand filtration requires vast volumes of treated heated pool water to clean the sand bed .The Filtrex regenerative media filtration filter provides a resource conserving solution for today swimming pools. Backwashing a 450m3 pool requires approximately 1500 m3 of water a year at today’s prices this equates to a saving of £13,000 a year using Filtrex regenerative technology. The Filtrex filter utilizes a system of filter aid regeneration and innovative filter elements called the flex tube. 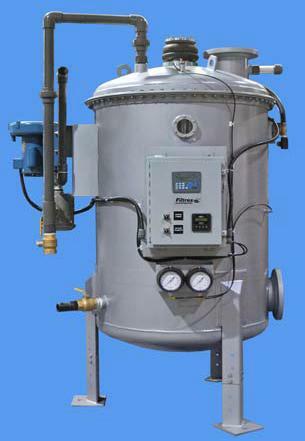 Filtrex regenerative system provides unpatrolled water clarity and remarkable operating efficiency. Filtrex Regenerative filtration filters to 1 micron reducing the risk from cryptosporidium and reducing the turbidity to .049 on the NTU scale Sand filtration best results is normally .49 NTU 10 time poorer. The main problem with a carbon steel tank is field longevity. Our stated goal in manufacture is that Filtrex Filters should give an effective service life equal to that of the facility itself. This in our opinion cannot be achieved with carbon steel construction regardless of surface treatments, coatings, linings, and processes. Premium grades of stainless steel used in conjunction with proper welding alloy/practices, shielding gas, and post fabrication passivation will produce a filter tank with a lifespan which can and will (if maintained properly) outlast the facility that it is installed in.